With central banks having destroyed savings for individuals across the Western world, there is hardly a single country out there that runs a capitalist system. Instead thanks to economic growth being run solely on credit expansion, the new norm in the financial realm is a model known as Creditism. Yet unlike capitalism, which has mechanisms (bankruptcies, debt dissolution) to deal with overheated expansions, creditism does not, and instead a credit based economy and monetary system requires ever increasing amount of debt/credit to be created to sustain itself. This means in a nutshell that once a nation goes down the path of creditism, they will never be able to pay off their debts, thus ending in a complete collapse. 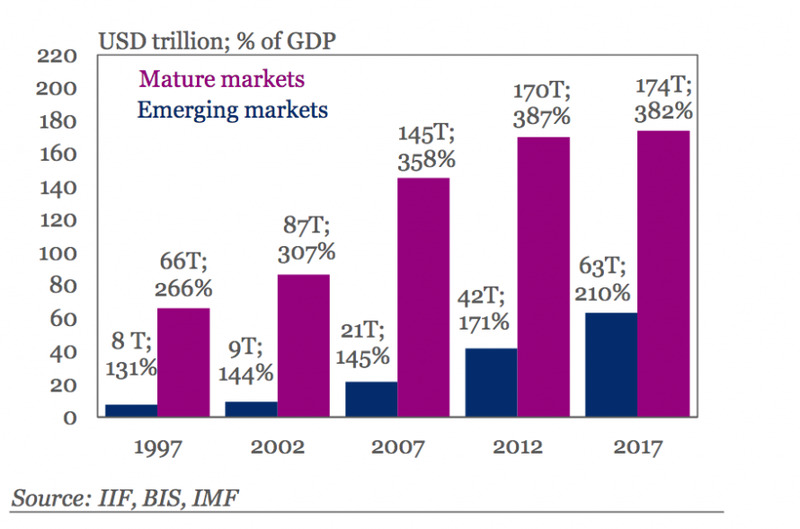 On April 10 the IFF came out with their latest quarterly report on global debt in which the world saw an increase of $4 trillion in Q4 2017 alone, bringing the amount of new debt created in 2017 to $20 trillion. And as it stands now the amount of global debt rests at $237 trillion, which is 3.82 times (382%) of annual global GDP. Now this number for global debt to gdp takes into consideration China's massive debt expansion as well as Europe and the U.S.'s. But let's take a look at just America's national debt to gdp ratio which stands well above 100%. Earlier this month the national debt crossed over the $21 trillion mark, and this does not include debt which will be created to fund the $1.3 trillion Omnibus spending bill. And when you realize that America's GDP is between $17.5 and $18.3 trillion annually, then the nation's debt is much greater than its productivity, meaning that without the ability to create credit at will, the country is insolvent. 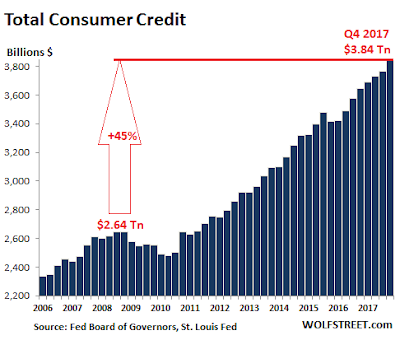 But of course with world governments being so fiscally irresponsible, and central banks wanting credit expansion to reach impossible heights, this has also led the American consumer to expand their debt use to record levels, which now stands even above the height of the Housing Bubble, and the period which led to the Financial Crisis of 2008. Collapse of either the debt bubble or global currencies isn't a possibility in the future, it is an inevitability. And with this in mind people must now be formulating plans for when this will occur, because the longer they wait, the worse off the consequences of a debt crisis will be for them and their livelihoods.